Going aboard a large aircraft carrier and exploring the daily job of the military people onboard seems like the perfect topic for the larger-than-life IMAX format. And that's the idea behind director Stephen Low's 2016 documentary, the latest in a line of IMAX-shot documentaries released by Shout! Factory. Although the topic here seems perfect, the execution is not, and Aircraft Carrier: The Guardian of the Seas is more visual and informational than engaging and involving. It shows us how things are done, but it never makes the human connection that a documentary like this needs...and, alas, it never even attempts to do so. Although I don't believe the aircraft carrier is ever mentioned by name in the movie, we're taken aboard the USS Ronald Reagan, although other ships (and even a submarine) are showcased throughout. We're shown the inner workings of the carrier, how planes take off and land, and are even given a quick history of warfare that has taken place on the water. 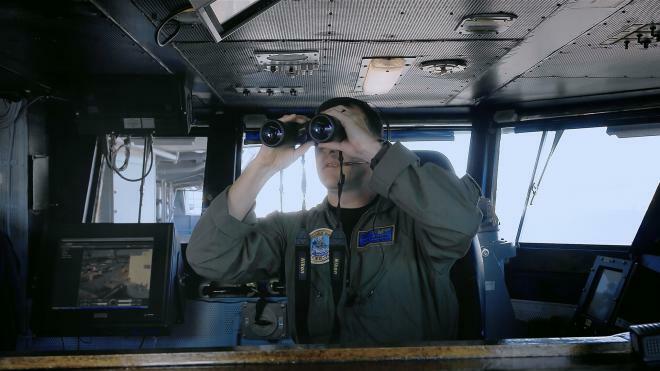 We're also treated to RIMPAC training - which is the world's largest maritime warfare exercise, featuring the vessels of countries around the world. Potential viewers may also be surprised to learn that the documentary also spends a little bit of time aboard a submarine, whose claustrophobic design is a nice contrast to the floating city feel of a carrier. Aircraft Carrier makes two mistakes as a presentation – one of them small, one of them larger – that I feel prevent the movie from working beyond its obvious appeal to fans of military vessels. First, when it comes to showing the parts/hardware that make the carrier run, viewers are given computer animation instead of showing us the real thing. While the animation does help break down each working part, one wonders why cameras didn't film the actual structures. 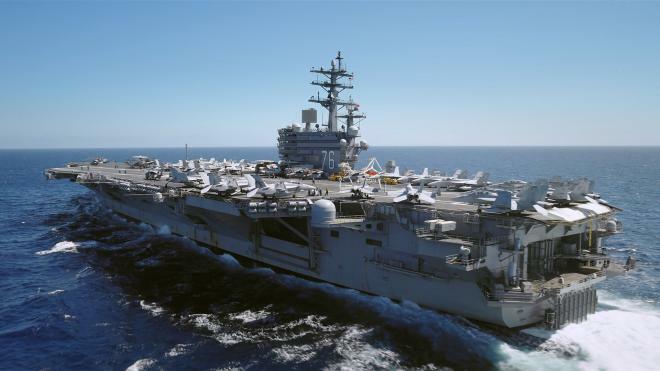 Are those portions of a carrier not accessible to the public for reasons of national security or is it simply too difficult to get bulky camera equipment to those parts of the carrier? We're never told. But the second and more vital problem I had with Aircraft Carrier is that it fails to establish any connection between the viewer and any of the men and women featured in the movie. Most of the people presented here we only get to see for a minute or so, and while we do learn their name and the position they hold/duty that they perform, we never get to meet the person behind the job. Yes, one could argue that that's not the intent of Low's documentary, but the result is a movie that is as cold as the steel and other metals that make up these pieces of machinery. The almost monotone narration by actor Maurice Dean Wint doesn't help matters. So while I do appreciate a documentary like Aircraft Carrier, I can't quite recommend it. I'm not sorry that I took the time to watch it, but it's not something I have any desire to sit through a second time. This one is for military hardware aficionados only. 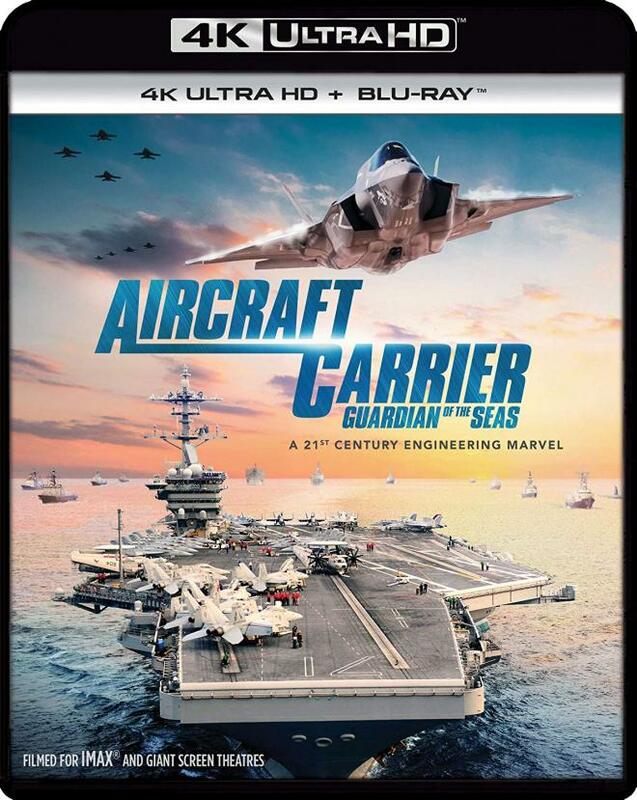 Aircraft Carrier: Guardian of the Seas cruises onto 4K home video in a black standard Elite keepcase. The case houses both the 4K UHD disc and the 25GB single-layer Blu-ray, along with an insert allowing users to download a digital copy of the movie onto their PC, iPhone, or other compatible device. Sliding overtop the keepcase is a slipcover whose artwork matches that of the keepcase slick. There are no front-loaded trailers on either disc, whose main menu features a montage of footage from the documentary, with menu selections horizontally across the bottom of one's screen. The Blu-ray in this release is Region A locked, while the 4K disc, as always, comes with no region coding. The Ultra HD disc features an HDR boost, but has not been coded with/for Dolby Vision. Still, the images here are impressive (and shown in the 1.78:1 format), but not without problems. 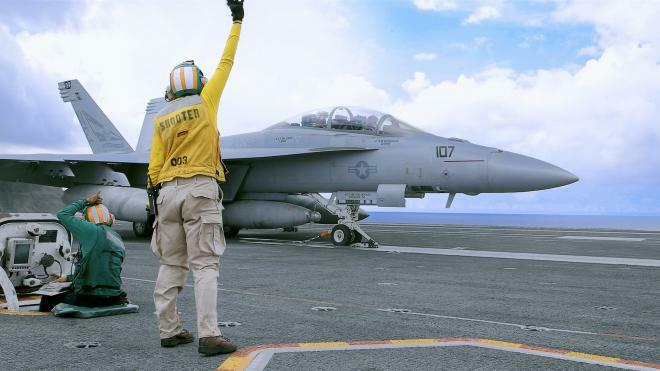 Aircraft Carrier was shot using IMAX cameras and the picture rivals that of other Shout! Factory UHD releases. The HDR gives a powerful color/contrast boost, which isn't obvious in many shots that take place on the water (where blue and gray are the primary colors shown), but really grabs the viewer when the documentary shows crewmen in multi-colored clothes on the carrier's deck or (in my favorite image from the movie) family awaiting along shore as their loved ones arrive home aboard a carrier. The most disappointing part of the image, however, is the frequent banding/posterization that occurs in far too many shots. It's hard to say if these moments were perhaps not filmed with Imax cameras or if the camera was just glitchy on the days in question, but there are at least a half dozen (possibly more, as there may be less-obvious ones I didn't pick up on) shots of the sky where banding is not only present, but blatantly obvious. There's at least one underwater shot (during the movie's submarine sequence) where banding occur as well. Other shots that seem to have been done via helicopter sometimes have a dark flickering at the top of the screen, which I first thought was some sort of aliasing glitch but then realized was just the HDR rendering of the helicopter blades in motion. While the amount of screen time these problems present themselves is minimal, it still seems like a lot for such a short documentary (appx. 43 minutes), and I'd be lying if I didn't say it took enjoyment out of an otherwise solid 4K visual presentation. Both the 4K disc and the Blu-ray disc in this release feature an English Dolby Atmos track that, while it doesn't provide the frequent "oomph" of truly reference-quality Atmos, does more than enough to enhance the documentary at the right moments. Given how many powerful pieces of military equipment are featured in Aircraft Carrier, one might expect frequent use of Atmos's overhead capabilities. But, in fact, that method is only used a few (noticeable) times in the movie and the most effective use is not with a plane, but rather when a submarine moves over and away from the camera. Much more effective is the Atmos track's use of the surrounds and, specifically, the separation and distinctness between different sounds – most apparent during portions of the movie where we're shown (via computer graphics) the working parts of the underbelly of the carrier. Dialogue is clear and understandable throughout (not just with the narration, but even that of the officers on duty), so there are no problems to report there. In addition to the Atmos track, the 4K disc also includes a French track in 5.1 DTS-HD Master Audio, while the Blu-ray disc has an additional track in French 5.1 Dolby Digital. Subtitles are available on both discs in English SDH only. Note: The bonus features listed below are available to view on both the Ultra HD and the Blu-ray discs. Audience Testimonials (HD 4:40) – This featurette provides some of the audience reactions (just the good ones, naturally) to Aircraft Carrier at the Reuben H. Fleet Science Center in San Diego. F-35 vs. Bugatti vs. Human Cannonball (HD 1:12) – A short animated clip comparing the speed of these three items and who would win (no bonus points for guessing which one). Usain Bolt vs. Giraffe vs. Nuclear Carrier (HD 1:07) – Another short animated clip comparing the speed of these three things (again, no points for guessing which one wins). F-35 Navy Selects Reel (HD 3:20) – This is just footage (with background music, but no dialogue) of an F-35 in flight, as well as flight deck activity aboard an aircraft carrier. Trailer (HD 1:43) – The official trailer for Aircraft Carrier. TV Spots (HD 1:00) – A pair of TV spots (each 30 seconds) for Aircraft Carrier. Like many of Shout! Factory's other 4K documentaries, at times, Aircraft Carrier: Guardian of the Seas can be a feast for the eyes. But a few video glitches (most likely from the source material) and a lack of a human connection in the feature presentation leave us with a documentary that is informative, but not very engaging. Rent It.